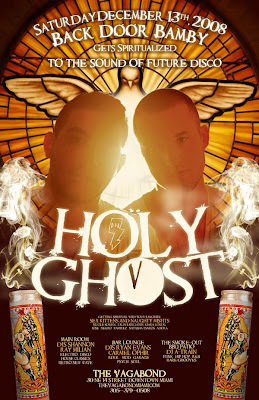 ::: Off the Radar :::: HOLY GHOST! Rocks The Vagabond SATURDAY!! HOLY GHOST! Rocks The Vagabond SATURDAY!! Basel was great, although it wore me out! Pictures coming soon... If you can't wait check out my Facebook page. Got them up there already. In the mean time wanted to do a quick post to promote this great show coming up this week-end here in Miami. Holy Ghost! (DFA) are gonna be spinning this Saturday, December the 13th at The Vagabond for their weekly Back Door Bamby party were I am also a Resident. Come out! Should be awesome! Luckily for me it's were I work. So many shows I miss on the week-ends due to me spinning. It's great when they come to me! Here's a couple great Holy Ghost remixes and their classic 2007 track 'Hold On' to get you excited for Saturday! I love that Holy Ghost remix of MGMT.